The trout (Salmo trutta) is an important part of Scotland’s natural heritage and as such is a priority species on the UK’s Biodiversity Action Plan List and has recently been listed as a Priority Marine Feature by Scottish Natural Heritage. Trout are a highly adaptable species found all the way from hill Lochs down through major rivers and streams to coastal estuaries and out to sea. However their broad distribution and diverse life history exposes them to to extensive threats. Including changing land use practices damaging their freshwater habitat and environmental changes and declining food supplies at sea. 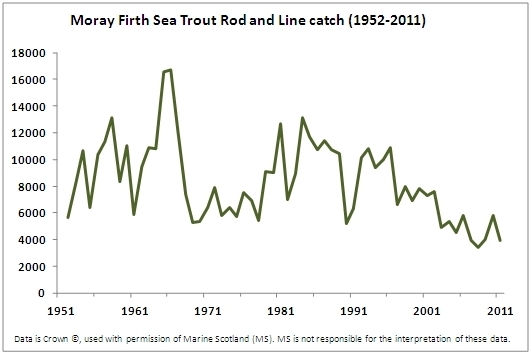 Falling sea trout catches all around Scotland are a strong indication of a declining abundance of trout and this is particularly prevalent in the Moray Firth where there has been a 42% decline in the average sea trout rod and line catch over the last 10 years. However, very little is known about the status of other wild trout populations. 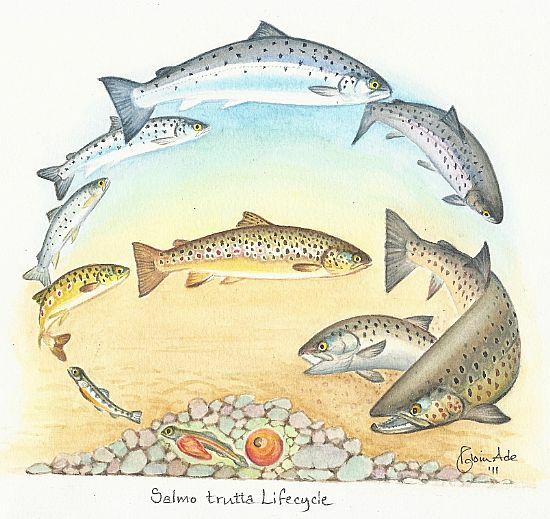 Sea trout and brown trout are the same species, Salmo trutta, and are both very important components in the complex and variable life history that sea trout adopt in different locations and environments. After the last glaciers retreated Scotland’s waterways were re-colonised by trout from the sea and as result all trout have a tendency to return to sea in their genes. However, many have adapted to life purely in freshwater or have become trapped behind natural and manmade barriers to form resident brown trout populations. In areas where access to the sea remains the trout population normally consists of a mixture of resident brown trout (majority males) and anadramous sea trout (majority female). Sea trout migrate to sea to feed and the majority are females as they have the most to gain from the plentiful food supply; they grow larger, can carry more eggs and dig better redds in the spawning grounds. When they return from sea they will breed with a mixture of small resident brown trout males and a few larger male sea trout. The balance of brown trout to sea trout and the mixture of males and females that go to sea is highly variable and has usually evolved to adapt to the local environment or river.